Hallmark goes into the archives for vintage images and pairs them with words and designs for today, in a centennial-inspired card line in stores this summer. 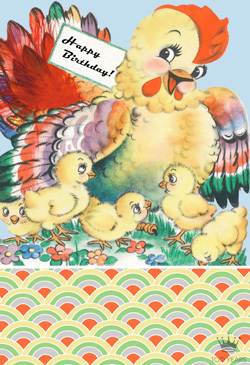 In the 1940s, it was a flock of chicks wishing mother hen a happy Mother’s Day. Today, it’s a happy birthday message from her peeps. Pups were silently playful in a 1930s-era card, but today bark to the tune of “Happy Birthday to You” through a 21st century sound chip. Those are just a few examples of how old and new come together in Retro Remix, a collection of 60 new cards that pay tribute to Hallmark’s 100-year history through messages of good cheer for today. To create the collection of 60 cards, the Hallmark creative team reached into the archives, finding cards from every decade in the company’s history, then re-imagined the images and messages for today's card-senders. “Looking into our archives was like glimpsing the anthropology of how America reached out to each other through the years — the ways we celebrated, supported, nurtured, and cared decade after decade,” says André du Broc, the line’s editorial director. “Language and protocol have changed quite a bit through the years but the need to recognize and honor people and moments has not. More of Andre's perspective. Several of the cards feature sound; some also showcase licensed properties with which Hallmark has had a long-standing relationship, such as Disney, Looney Tunes™ and Peanuts®. 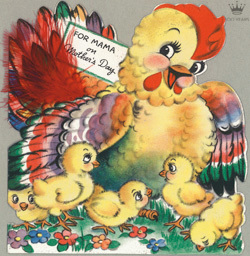 In the 1940s, it was a Mother's Day card from the chicks. Today it's a birthday card "from me and the peeps." 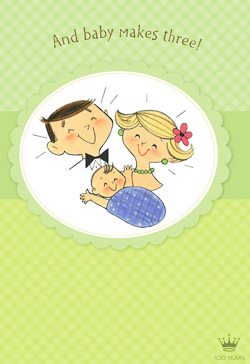 Card-buyers in the 1960s soundly rejected this too-sarcastic card. The image returns as a sweet welcome to today's new family member.